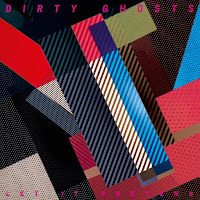 Dirty Ghosts' 2012 album Metal Moon hit me like a ton of bricks. It was refreshing to hear a female-dominated project do the Garage Rock thing as hard and forcefully as Allyson Baker did. Fast forward a few years and we're now getting the release of the follow-up Let It Pretend. This is a much different record than the first one. While there were always undertones of New Wave influence, this record puts that sound squarely in focus. The result is the nearly complete lack of the overt aggression of Metal Moon. The album begins with a vibe that will become quite familiar over its course. "Some Kids" is heavily influenced by the ominous side of '80s New Wave. It's quite similar to the evolution of punk bands as they adapted to the new decade (think late The Damned). On "Light Like Speed" we can hear reflections of early B-52s material. One exception is the album closer "Moving Pictures". The guitar line has a Misfits-esque quality to it. The bouncing feeling of "Quicksand Castle" is provided by the driving bassline. In the oddest bit we get a light quasi-Industrial grind that we get on "So Shallow". The slickest track on the record is the title cut. It adds a glossy chorus to the dark New Wave happenings. Let It Pretend is an album that has its moments, but it is a far cry for what I was hoping to hear. Dirty Ghosts play The Hoxton in Toronto on October 11th. Best tracks: "Let It Pretend", "Quicksand Castle"